We just released the newest version of our xSQL Profiler and besides the increased range of supported SQL Server versions and events that can be traced, as well as some other bug fixes and improvements there were some changes in the setup and installation. Let's go through the new installation shall we? A new feature in the xSQL Profiler installation is the ability to choose a "Standard Installation" and have all the configurations done behind the scenes as opposed to the "Advanced Installation" where you have to manually enter each configuration option. There are a few things to keep in mind with the Standard Installation though. First of all, you need to have a SQL Server 2008 and up installed as a default instance. By default xSQL Profiler uses "(local)" as the server name which means that it will search for the default SQL Server instance on the machine. One thing that might confuse you a little bit is that just because you have SQL Server installed on your machine, it's not necessarily the default instance, even if there is only one SQL Server installed. You need to manually tell the SQL Server installation to register the instance as a default instance. If you haven't done this during installation, and are reading all those forums that say it cannot be done after the instance is installed, there is no need to panic because they are simply not correct. Here is an article on how to do that. 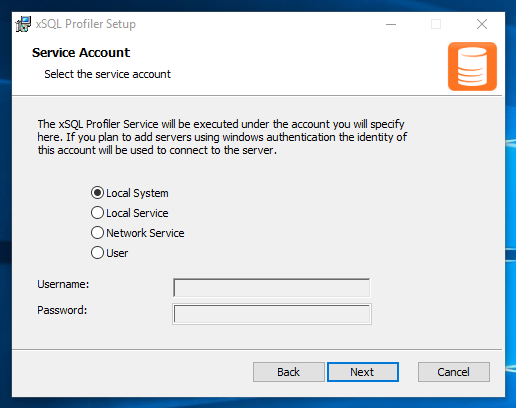 The next thing to note is that the xSQL Profiler service will run under the "Local System" account. This is necessary because it is the only built in service account that is sure to have access to SQL Server (neither "Local Service" or "Network Service" can access SQL Server by default). However, if you have SQL Server 2012 and up, even the Local System account doesn't have access, so you will need to manually configure this account to be able to access the SQL Server. Keep in mind that this is a very high privileged account so you need to be very careful because you can expose your system to some security risks. You can always change the account on which the service is run on after it is installed and manually provide the necessary permissions. Like all previous versions of xSQL Profiler this version supports the advanced installation if you like to manually specify all the configurations for xSQL Profiler. The first thing you do is specify the account that xSQL Profiler's Service will run on. Your options here are one of the three built-in service accounts (for more information on those check out this MSDN page), or a separate windows account. If you do choose one of these accounts, like mentioned above, for versions up to SQL Server 2008 R2, by default, only Local System can connect with the server instance and for versions later than that, none of the service accounts can connect with the instance. So if you choose one of these you need to manually configure the account to be able to connect with the server. Keeping with the principle of least privilege, the best thing to do is create a new user specifically for the profiler's service and give it the necessary permissions. The minimum set of permissions it needs are "Log on as service" and permissions to connect with the SQL server instances. The next thing you need to do is to choose the SQL server where the xSQL Repository will be created and provide the authentication details for that server. This is fairly straightforward, much like providing the authentication details when you use SQL Server Management Studio. You provide the server name and authentication details, as well as the new database's name. The data you provide here will only be used by the setup to create the database and then discarded. 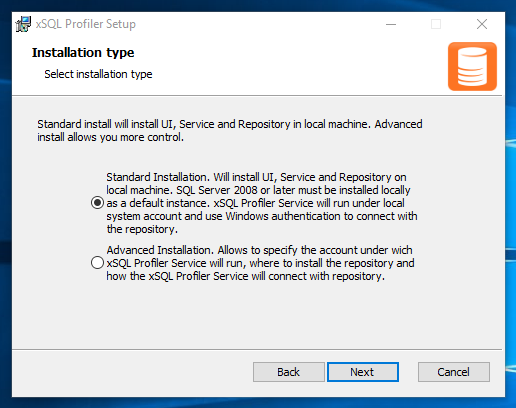 You can choose a SQL server on the local machine or on another machine as the server that will hold the repository for xSQL Profiler. 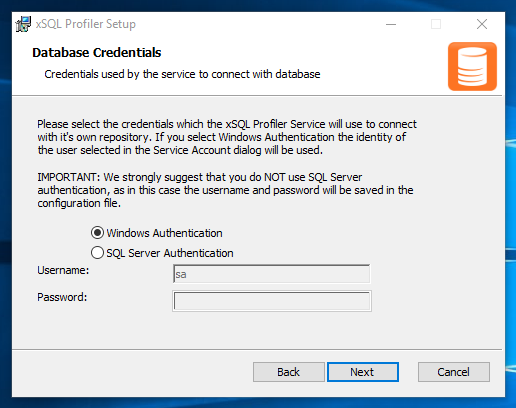 If you choose the Windows Authentication option, the current logged in user will be used to connect with the database, so make sure that user is registered as a login on SQL Server and has permissions to create a database. 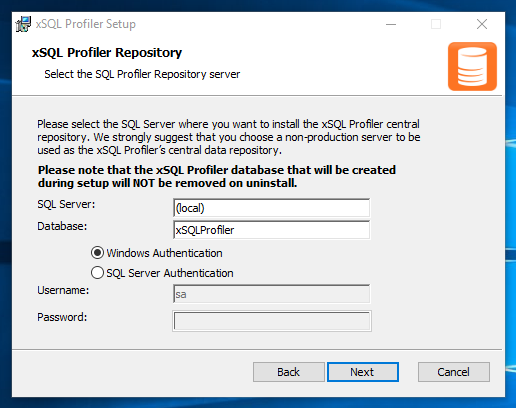 The last thing you need to do is to provide the authentication details that will be used by the xSQL Profiler's service to connect with the repository. The service's user needs to have the necessary permissions to access the database. The security risk of SQL Server authentication can be mitigated by choosing a SQL Server user with the minimum set of required permissions but this will, again, require some work to be done. You can do this after xSQL Profiler has been installed because the authentication details in this step are not used during the setup. They are used when you run the application. So there you have it. All you have to do now is click "Next", review the installation details and if you have provided the correct information, the setup should complete without errors.